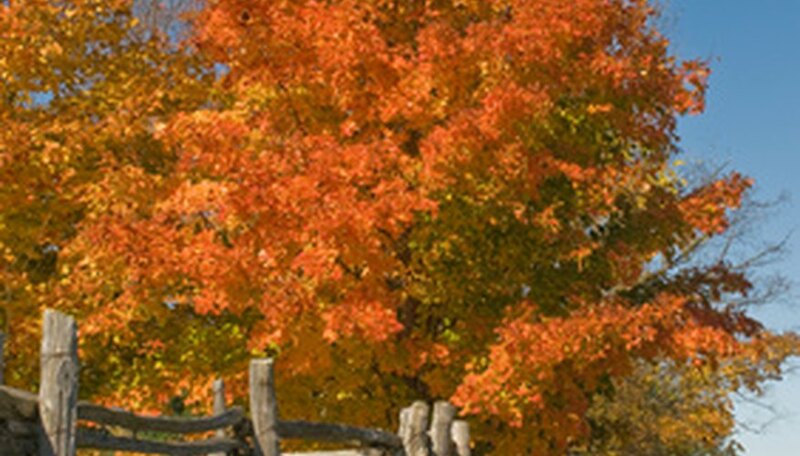 One of the most popular landscape trees in North America, the maple tree, is prized for its beautiful fall foliage colors and its sap that’s used to make syrup. There are many different species of maple trees. All have a few common characteristics that make them stand out from other types of trees. Maple tree species have similar leaf characteristics, with few differences among the species. Maple tree leaves are palmately lobed, meaning that each leaf is divided into distinct sections and shaped like a hand. The number of lobes may vary between the species, however. For example, the sugar maple, black maple and red maple have leaves with as few as three lobes, while the silver maple’s leaves each have five lobes. 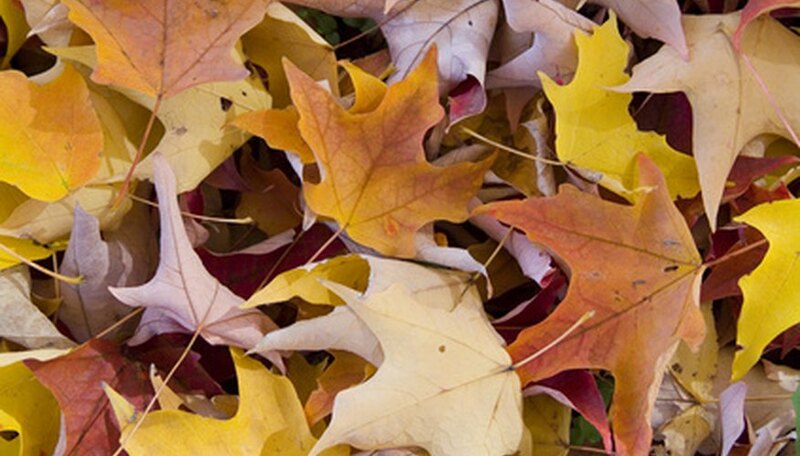 Maple trees also have deciduous leaves, meaning that they drop from the tree in winter. Maple trees are probably best known for their brilliant fall leaf colors, although the exact colors vary between the species. Maple tree leaves change to shades of yellow, orange and red in the fall season. The silver maple has yellow and brown fall leaf colors, while the red maple has, of course, bright-red leaves in autumn. 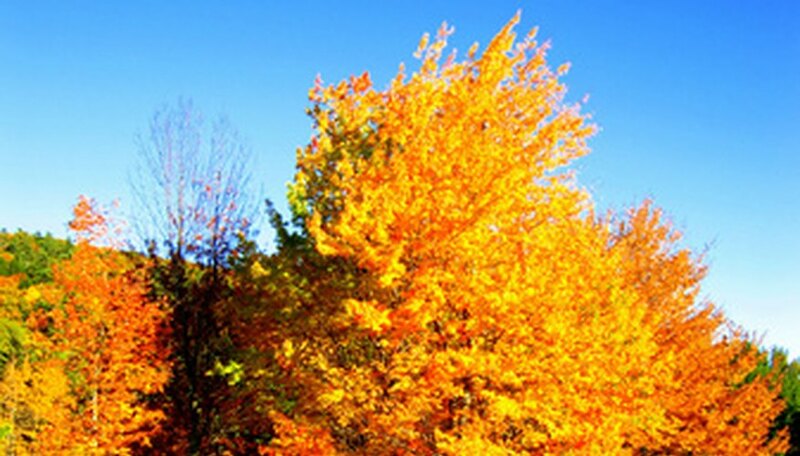 The sugar maple has yellow, orange and reddish leaves in fall. Maple trees usually reach heights of 50 to 75 feet at maturity, although most remain smaller in home landscapes, usually about 20 to 30 feet tall. Maple trees have spreading crowns with horizontal branch formations, and develop a compact and rounded canopy. The sugar maple sometimes develops a slightly conical form, while the red maple has a pyramidal crown with ascending branches when it’s young and develops a more rounded canopy as it matures. Maple trees generally have smooth, grayish-brown bark when they’re young. As maple trees age, they develop brownish, rough and sometimes corky bark on their trunks that usually splits into ridges and furrows. Maple trees have twigs that are slender and shiny. 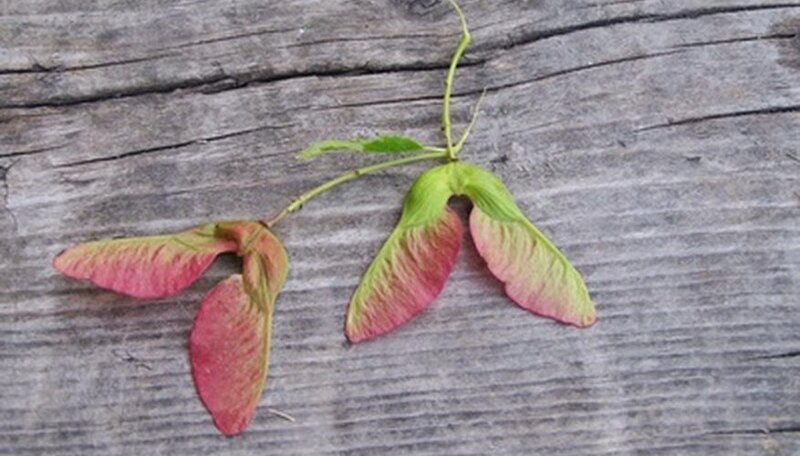 All maple trees produce “fruits,” which are actually seed pods. These seed pods take the shape of a double-winged “samara.” The winged seed pods contain one or two seeds and are usually about 1 to 2 inches long. The time of year when the fruits mature can vary between the species, with the sugar maple’s fruits maturing in autumn, and the red and silver maples’ seed pods maturing in the springtime.